Is there a way to see/add Total Calories to the Trends page? Can you add the total Calories on this pop-up, or is there an option to turn that on? It is on the Trends page, on the Calories Consumed graph. There isn't an option to show the total calories in the pop-up - but that's a great idea to have another handy piece of information. 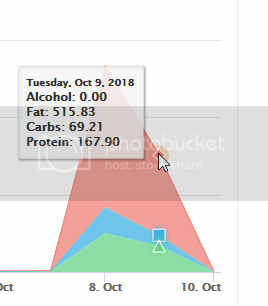 You can use the units labeled on the left side of the graph to get an idea of the total calories.